I don’t quite know what to say about summer vacation. Even when Sarah was in public school, we didn’t just, you know, sit in the house and play video games and shut down for the summer – in fact, when she was in public school, it was the time we crammed in absolutely EVERY other activity we wanted to do! Now, it’s more just a warmer version of the rest of the year – and I like it that way. Sarah likes that nothing we do in June will count as “school” – because the silly state of Pennsylvania says you can’t begin counting the days for your school year until July 1. I find that ridiculous, but it doesn’t mean we’re putting off any learning. Can you just see me? Me: Well, if I answer that, we’ll probably learn a bunch of stuff. Can you wait and ask me again July 1? No way! So here we are, living and learning through June! Linking up today to the “I’m glad it’s back” edition of 7 Snippets of Unschooling and to Collage Friday and the Weekly Wrap-Up. 1. Sarah finally got her mohawk. Well, a fauxhawk. Basically, she got a haircut that can be put into “hawk” style with some gel and hairspray. And then she took her own picture. 2. We absolutely love our garden slugs. Other people kill theirs, but we name them and count them and basically go out of our way to encourage general sluggishness (in the yard). 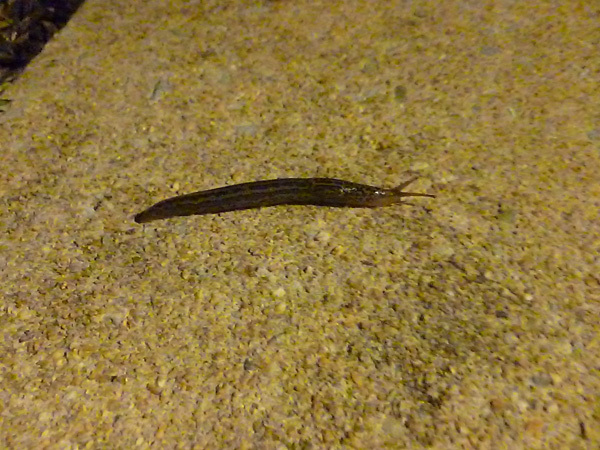 The night that we took this photo, Sarah counted about 15 to 18 slugs of various sizes on the front walk and garden. She called us all outside to show us each one under the beam of her flashlight – even the little tiny ones! 3. This one is just funny. Chris turns to Sarah in the middle of a discussion about – I’m not sure what. I don’t know if I’ve ever seen my (admittedly dorky) husband so excited about our learning. Post by Joan Concilio Otto. 5. I’ve said before how awesome our 4-H club (York County Wildlife Watchers) is – and this month’s meeting was especially fun. 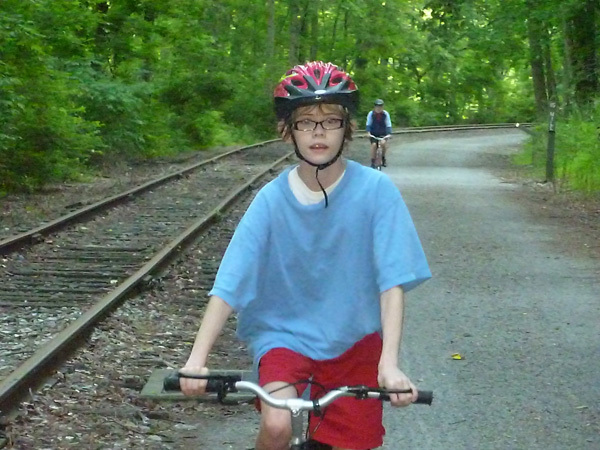 We all went out together and biked or walked a four-mile (a little longer for some of the bikers) segment of our local rail trail. The best part is, we have such a good time with all the other families – I must have walked and talked with just about every family there; Sarah biked with our club leader’s dad (“Grandpa Ned” to the whole group) for half; and then I walked the last 2 miles back with a teenage friend of ours who is always a blast to talk with, while Sarah biked with some of her older girlfriends and Chris walked with Sarah’s friend Gabby and Gabby’s grandfather. I just love that we have a group of kids and adults of all ages and backgrounds who can get out and just enjoy being outside together. I only wish we could do it more often! 6. Sarah has amassed a miniature collection of Beanie Baby bears from various yard sales and whatnot. 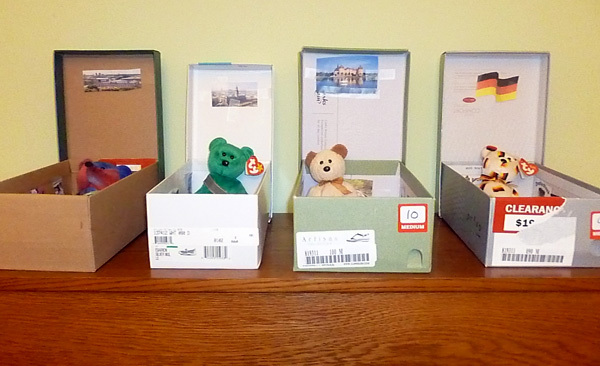 She loves to build “houses” for her stuffed animals, so she repurposed some of our old shoe boxes for a collection of them recently. The best part is that she decorated each house to match that bear’s theme. The bear covered in German flags – named Deutschland, which Sarah now knows how to pronounce – has German flags, German castles and German food on its walls. The one named Lucky, an Irish bear, has Irish castles and so on. 7. Mr. Bill isn’t always cute (like he was in the video). Sometimes he annoys the heck out of Sarah. 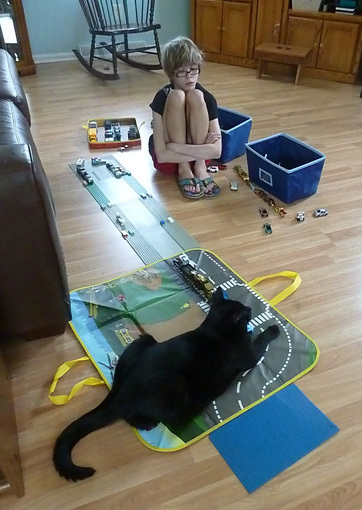 Like when he sits on her road scene. So there are seven wonderful things from our unschooling life this week. We just got back from a two-mile walk around our old golf course, and Sarah is now re-watching the Royal Albert Hall 25th anniversary Phantom of the Opera production. Later, the plan is to play badminton with Chris – the thing he asked for as his Father’s Day gift. Couldn’t ask for a more fun few days! This entry is about animals, exercise, movies, photos, science, unschooling. The previous post was Mom learns, too: Books I’m reading about education. The next post is Our scrapbook: Mom-and-daughter calligraphy projects. I can relate to the Beanie Baby houses, too — we’ve made a few of those in the past several years! You’re very welcome, and thanks for stopping by! Phantom is my favorite musical too – which makes it all the cooler that my daughter loves it so much! 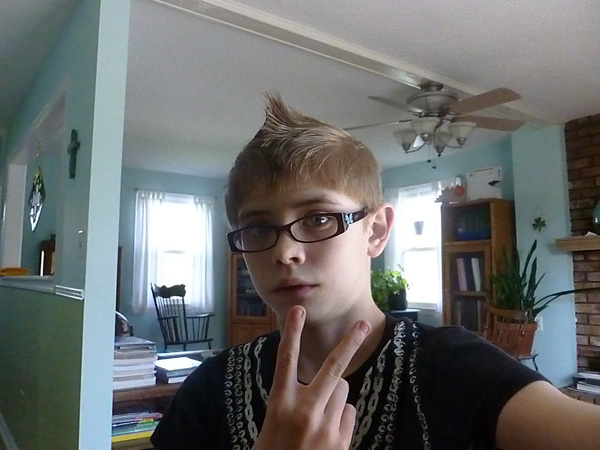 Love the fauxhawk! Raven was sad that I didn’t give her one this haircut. Up next is the turquoise dye just on the hawk part. (This is, by the way, also MY hairstyle, though I rarely hawk it.) We’re trying to figure out how we want to do it – she has REALLY porous hair (as do I), so when we do standard dyes, we end up with all-over colored hair when we rinse it out. I got some temporary spray, but we really want something a little longer-lasting! We’re “those” people – LOL.